So … you’re driving in the car … you turn on the radio and hear an intriguing story only to blank on the primary source for the report. Has that ever happened to you? I was on my way home from town this morning and one of the news items on NPR concerned a report on the current status of global sustainability. Because I did not catch the original source I did a quick search for it when I got home. Although I am not absolutely convinced that the following is the source for the NPR story, the conclusions are the same. Visit the Global Footprint Network (the figure below is from there, World Footprint). Similar findings are at the 2012 Living Planet Report. The bottom line to each of these sources is, at current rates of consumption, Homo sapiens is using the resources of the planet at a rate of 1.5 Earths each year. 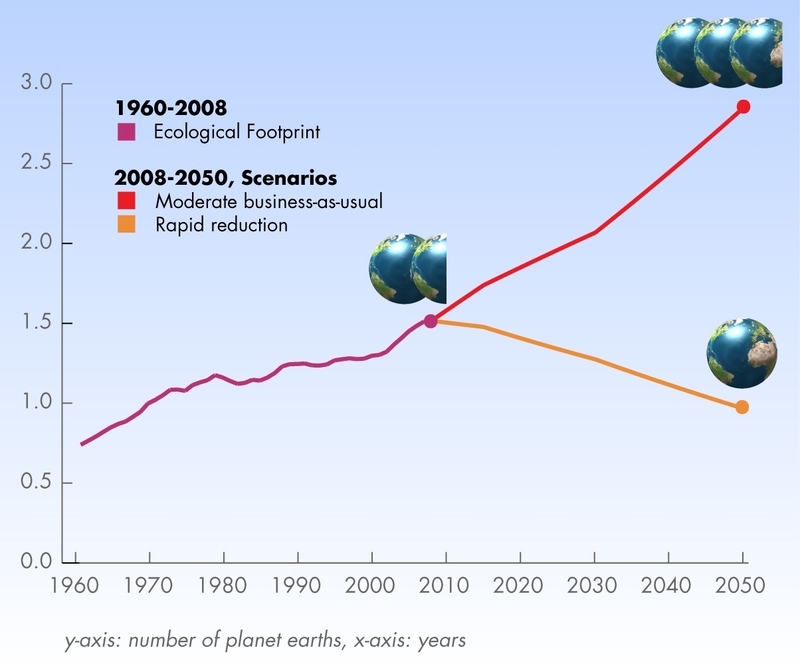 Remember that a sustainable rate of consumption is one at which the Earth is able to replace resources as rapidly as they are used (1.0 Earths per year) – like running on a treadmill and going nowhere. We have currently overshot this breakeven rate by 50%. The bad news is that, by all indications, this rate of consumption is increasing and is predicted to reach 2.0 Earths by 2030, and 3.0 Earths by mid-century. The big players in this unbridled and selfish consumption are Qatar, Kuwait, United Arab Emirates, Denmark, and the United States. The most depressing aspect of this is, given all that we have been doing in support of global sustainability, we still can’t get the train to stop or even slow down – at all. It’s like a bad dream … you’re driving and see something in the road ahead of you … you hit the brakes … they don’t work … you push again, harder this time … to no effect. We must redouble our efforts to reverse this phenomenon … wake up, recycle, get by with less stuff, and tread lightly … these are all investments each of us are going to have to make in support of our not-so-distant futures. Let us agree to start today.